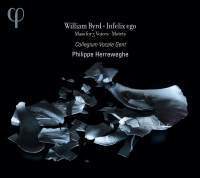 Coming so soon after Martin Baker’s version of all three Masses of William Byrd (Fanfare 38:3), Herreweghe’s version of the Mass for Five Voices must inevitably be compared with it. The real rivals might rather be the vocal ensembles of Andrew Carwood (24:4), who writes the notes for this disc, and the Hilliard Ensemble (8:6). Both of these issues include all three Masses, and Herreweghe has by far the fastest tempos in every movement of all four versions of the Mass on this disc. Herreweghe matches Carwood with two voices to a part (the Hilliard used one voice to a part, like the Deller Consort). Herreweghe offers a strong rendition of the Mass, similar to Carwood’s own, so by the end of the Agnus Dei he hardly delivers the sublime morendo that the Hilliards and Baker achieved. Baker’s is easily the current version to have. The Byrd motets heard here are a cross-section of his work: the early Vespers hymn, a motet from the 1575 Cantiones Sacrae, the incomparable Infelix ego to Savonarola’s text, and the Marian offertory from the late Gradualia. The short playing time of the disc might have been ameliorated by a more generous selection of motets. Philippe de Monte is usually represented on a Byrd collection by the psalm setting that he sent to Byrd, which elicited a response with the completion of the psalm that Monte began, but here an unrelated psalm is included instead. Alfonso Ferrabosco (the elder) is represented by a funeral respond that Byrd also set (the latter is currently available in Carwood’s complete collection). Carwood offers the suggestion that the three composers on this program created passionate music because their religion was repressed, but in fact Monte spent all his time on the unrepressed parts of the Continent except for a year in England under the Catholic Restoration. Even so, his notes are literate and informative. The singing is lovely in the way Herreweghe customarily delivers with his group, and the sound, taken in a church in Italy in early August (fancy taking his people on a summer getaway), is well controlled. Nicely done on its own terms.